Beans are ground directly into the port-a-filter (automatically when inserting the portafilter). The coffee retention level has been minimised; as a result the grinder guarantees tightness. Stable grinding disks of large diameter (65 mm) and a low-speed motor ensure even grinding. Capacity of the grinder is approx. 3.6 - 4.8 grammes per second. 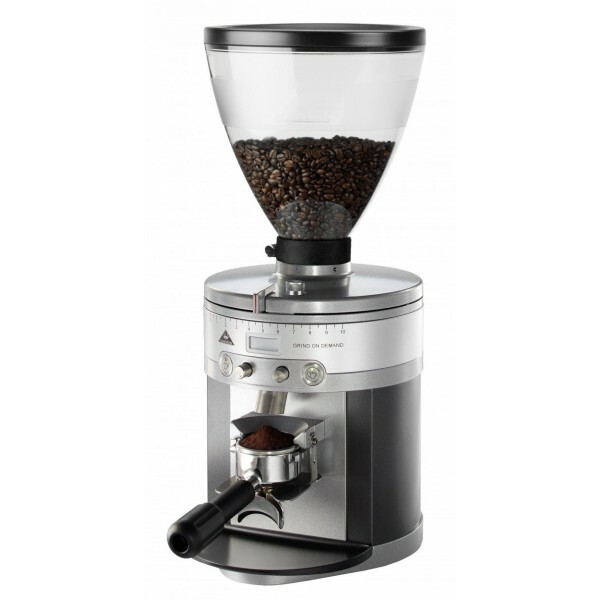 The grinder is also equipped in a capacious hopper which can hold 1.5 kg of beans. A clear fineness scale is located at the front panel of the device - there are 21 finenesses to choose from. Electronic times allows adjusting a dose of grinding coffee. Two programmable buttons allow setting single and double dose. For the convenience of a user, there is also a clear display on the panel.